Érezze megtiszteltetésnek / Feel honoured Pályaív / Ernst - Capa Új evidenciák / New Evidences MUNKA szavalókórus / LABOUR speech choir Lépésről lépésre / Step by Step Home Két férfi / Two men Hatalmi szóval / Words of Power 1-2-3. Hatalmi szóval 1. Performance in Parliament Hatalmi szóval 2. Politikai karaoke-színház / Political karaoke-theater Hatalmi szóval 3. 1. The idea of setting up protests in Avellaneda came from the strong tradition of protesting in Buenos Aires. I set up different types of protests, built on each other. In the first one I was protesting alone on the streets of the neighborhood, against personal things, even against myself. 2. 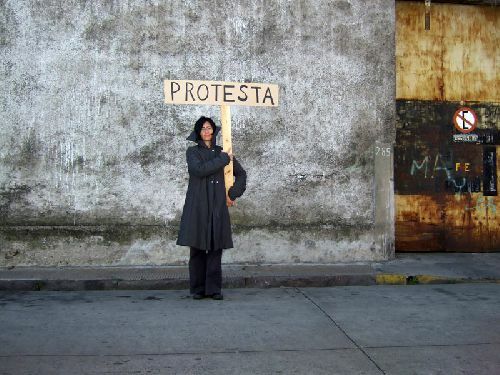 I talked to people on the streets who became interested what I was protesting against. Many people seemed to be interested. I asked them to hold the table and think on something personal, which they would like to change in their lives but they cannot. I took photos of those people who would let me do that. However, most people didn't like the idea to be taken a photo of. 3. I collected signatures to pretend that I can convince many people to protest with me. I managed to collect a lot. I put the great amount of fake sheets in boxes. However, the call was real. You can read the call for protest here. 4. On the last day of my stay I bumped into a protest in the city (like almost every day). This one turned out to be a really big one, and also that it was among those kinds where nothing is like it seems to be. I could easily feel I did convince so many people to come to the streets, and they were all marching for me.